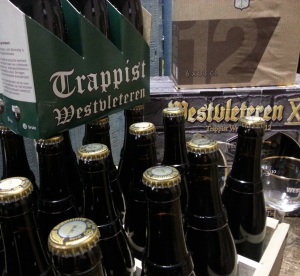 Westvleteren 12 (XII) was re-voted as Best Beer of 2013 by the people of Ratebeer. Along with the Westvleteren 12 (XII), the Westvleteren 8 (Extra) came out as N° 19 and the St Bernardus 12 from Brewery St Bernard (very hard to distinct from the Westvleteren 12) was voted as the 46th out of 50 Best Beer by Ratebeerians from all over the world. 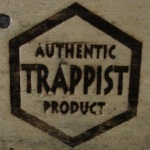 Enjoy the Westvleteren experience @ Belgiuminabox !! In the midst of the Holiday Season, without a lot of buzz and without any big marketing stunts Brewery De Dolle Brouwers from Esen came out with one very, very good brew. 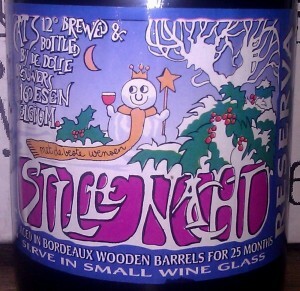 The epic Stille Nacht Reserva matured for a whopping 25 months in wooden barrels that used to hold Bordeaux wine. The Stille Nacht Reserva 2010 is only sold at the brewery by Kris Herteleer, the brew-master and his wife who takes care of of the brewery-pub. This great brew can’t be found at any of the Belgian beer-shops and none of the local beer-merchants got the chance to stock the beer. Lots of people and year-long fans of the brewery have contacted during the last couple of weeks to sound me upon availability of the Stille Nacht Reserva 2010. I don’t like to disappoint people and want to offer this beer to an as wide an audience as possible, so only a limited amount of bottles will be available for sale at any given moment on the shop. Feel free to shoot me a mail, I’d love to read your thoughts and hopefully receive some of your tasting notes of this unique batch. And yes, to everyone I wish you, your friends and family all the best for 2013 ! !